A medium-sized (7 ½ -8 ½ inches) songbird, the European Starling in summer is most easily identified by its glossy iridescent body, long yellow bill, and short tail. In winter, this species becomes duller overall with white-spotted plumage and a dark bill. Immature birds are dull brownish-gray, but are shaped similarly to adults. Male and female European Starlings are similar to one another in all seasons. The European Starling is native to Europe and West Asia, wintering to North Africa and the Middle East. In recent times, this species has been introduced elsewhere in the world, including in temperate North America, South Africa, Australia, and New Zealand. Some introduced populations of European Starlings migrate short distances in spring and fall, but many such populations in warmer climates are wholly non-migratory. European Starlings inhabit a wide variety of open habitats, including grasslands, meadows, and agricultural fields, across their wide range. This species has also been incredibly successful at utilizing man-made habitats, and may be found in the heart of major urban areas. 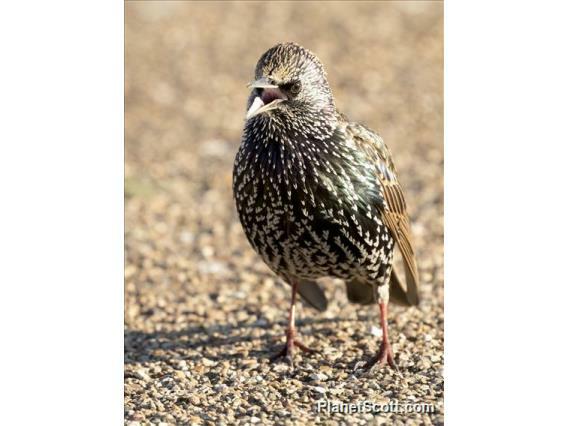 European Starlings eat a variety of foods, including seeds, grains, insects, and (in some areas) human refuse. In temperate and subtropical parts of the world, the European Starling is often one of the most visible bird species, particularly in urban areas. Individuals may be observed foraging for food in fields, yards, parks, and even on bare sidewalk. This species is a cavity nester, and birds in introduced populations are frequently reviled for aggressively displacing native birds from nest sites. European Starlings are primarily active during the day. Bibliographic Citation: Rumelt, Reid B. Sturnus vulgaris. June-July 2012. Brief natural history summary of Sturnus vulgaris. Smithsonian's National Museum of Natural History, Washington, D.C.